Leafarctica is an interactive map which allows you to view NASA MODIS satellite imagery of the Antarctic. The map includes a polar view which would be impossible with the usual Web Mercator projection used by most interactive mapping platforms. The map includes a date input field which allows you to change the Antarctic satellite image displayed on the map by date. 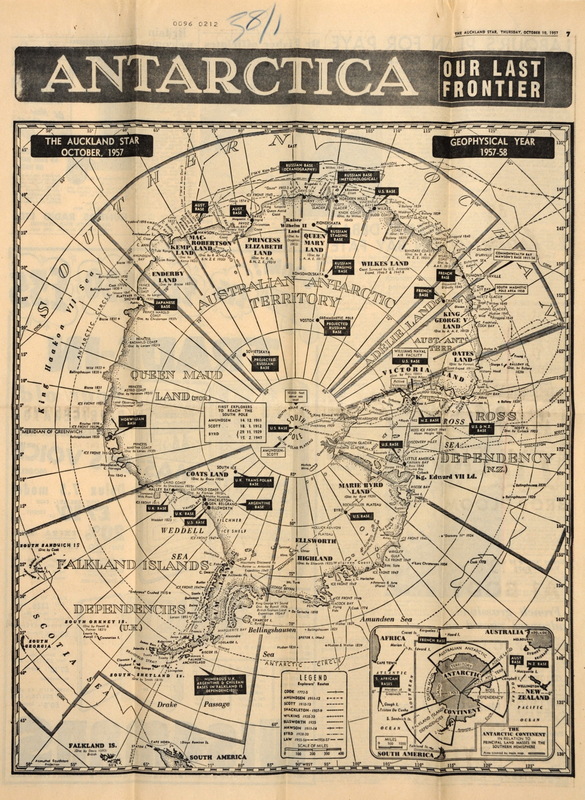 Antarctica, Our Last Frontier : map from the Auckland Star newspaper, October, 1957.
see : GeoGarage platform blog. The oceans play an important role in the earth's climate; they transport heat from equator to pole, provide moisture for rain, and absorb carbon dioxide from the atmosphere. Ocean models, such as this one from Los Alamos National Laboratory, help explain interactions between individual eddies that may be altered in a changing climate. Colors show speed, where white is fast and blue is slow. Detailed turbulent structures are visible throughout the Southern Ocean, where the Antarctic circumpolar current flows eastward around the globe. Large eddies are particularly visible in the Agulhas current at the southern tip of Africa. 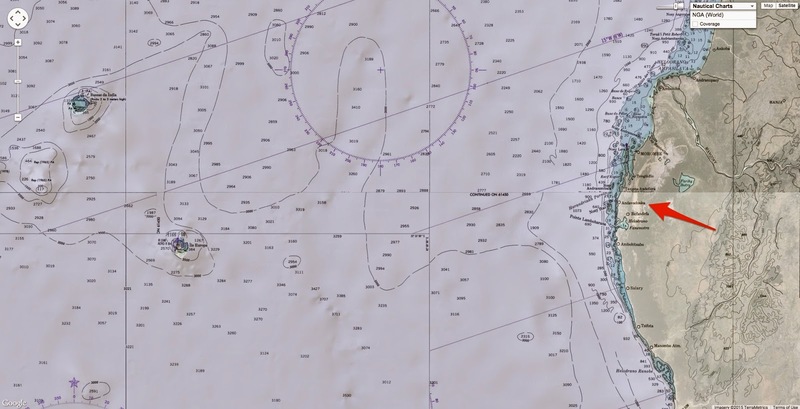 These ocean simulations are validated against satellite and shipboard observations. Even though individual eddies occur on scales of 10-150 km, their cumulative effects have large and long-ranging consequences on the earth's climate. 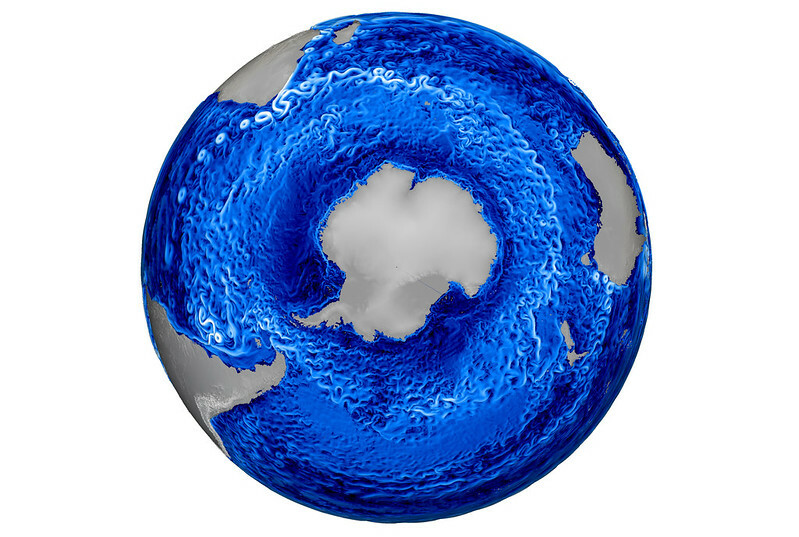 In the Southern Ocean, eddies transport heat poleward. The strength of large-scale circulations in the northern hemisphere is sensitive to the turbulence in the Southern Ocean. Ocean models are used to test how these interactions may be altered in a changing climate. This high-resolution simulation includes 90 million grid cells, ranging from 10 to 30 km in horizontal width. It is run on a super computer using eight thousand processors. The MPAS-Ocean model is developed at Los Alamos National Laboratory by the Climate, Ocean, and Sea Ice Model team (COSIM). MPAS-Ocean is a component of the Accelerated Climate Model for Energy, a new climate model by the Department of Energy. “Sitting in a boat in the midst of these aggregations is akin to sitting in a pot of popcorn as the kernels explode into the air. 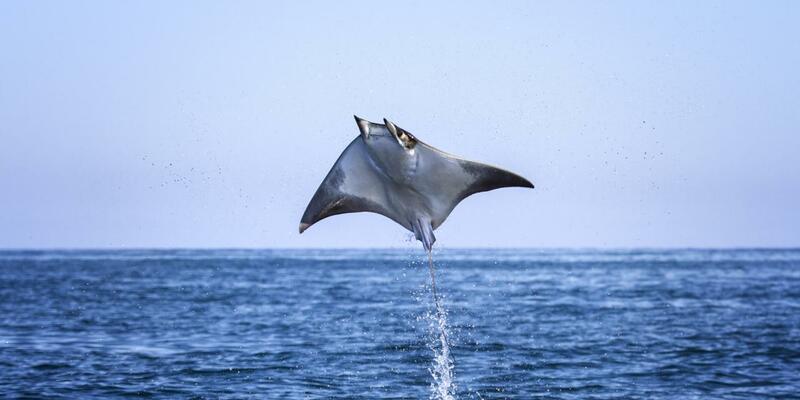 Everywhere you look mobulas are leaping out of the water and landing with a loud smack, sometimes just a couple of meters from you,” says Joshua Stewart, from the Gulf of California Marine Program, who studies rays in Mexico and across the world. Mobula rays’ elusive nature and skittish behaviour in front of divers has made them difficult to observe in the wild, except when they breach the water. Mr Stewart explains that even large aggregations, like the one in the Gulf of California, can sometimes be hard to find, as they can occur in different locations and at slightly different times of the year. In order to shed some light on these animals Mr Stewart applies some of his findings from his research into the larger manta rays he completed with the Manta Trust. For example, he knows that manta rays have to start their leaps fairly deeply, in order to build up enough speed to leave the water. As a species that likes to come together, they are an easy target for fishermen and many rays can be caught in a single attempt. Fishing spawning aggregations of other species is known to cause numbers to plummet. GeoGarage blog : Pelicans and flying rays / Image of the week : "Flight of the Rays"
exposed on Assateague Island in Virginia, US. Sea level rise sped up over the last two decades rather than slowing down as previously thought, according to new research. Records from tide gauges and satellites have shown sea level rise slowing slightly over the past 20 years. But as the ice sheets of West Antarctica and Greenland shed ever more water into the ocean, climate models show it should be doing the opposite. 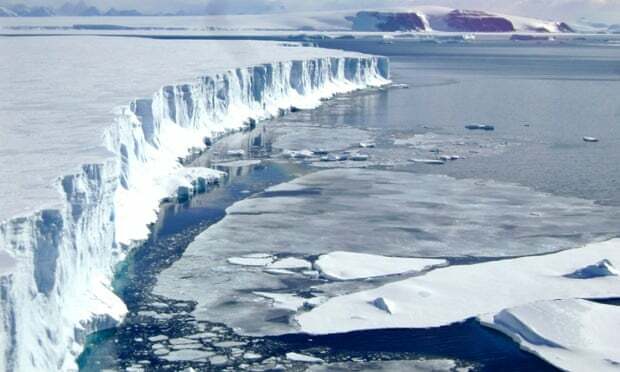 “The thing that was really puzzling us was that the last decade of sea level rise was marginally slower, ever so subtly slower, than the decade before it,” said Dr Christopher Watson from the University of Tasmania who led the new study. he leading edge of the remaining part of the Larsen B ice shelf. A separate ice shelf, Larsen C, is thinning from above and below, scientists found. 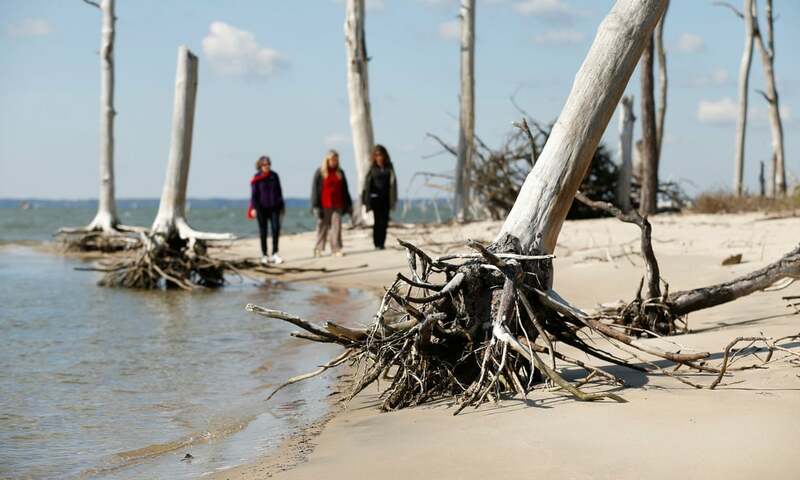 Watson’s team found that the record of sea level rise during the early 1990s was too high. The error gave the illusion of the rate of sea level rise decreasing by 0.058 mm/year 2 between 1993 and 2014 , when in reality it accelerated by between 0.041 and 0.058 mm/year 2 . This brings the records into line with the modelling of the UN’s climate science body, the Intergovernmental Panel on Climate Change (IPCC). “We see acceleration, and what I find striking about that is the fact that it’s consistent with the projections of sea level rise published by the IPCC,” said Watson. Professor Jonathan Gregory from the University of Reading and a lead author of the IPCC’s most recent climate report said the study was “interesting and useful” and shored up the predictions of the models. “The better agreement of the altimeter record after the correction ... is a reason for greater confidence in the projections,” he said. Sea level rise is measured using tide gauges on shorelines around the world and, since 1993, altimetric satellites. But both sets of data are imperfect. The land the tide gauges sit on is constantly shifting. For example, said Watson, measurements in Alaska are thrown out by the continent rebounding upwards after being covered in a heavy ice sheet during the last ice age. While in Perth, Australia, the continental plate is subsiding. The satellites orbit 746 miles above the Earth at 4 miles per second, firing beams of radar at the sea’s surface and recording the time it takes to bounce back. Watson said their accuracy was “staggering”. But the level of precision required to measure the slight but significant changes in sea level driven by climate change is very high. During the 1990s the satellite instrumentation degraded, losing some of its accuracy. Watson’s team were able to compare the two data sets and identify where each was going wrong. 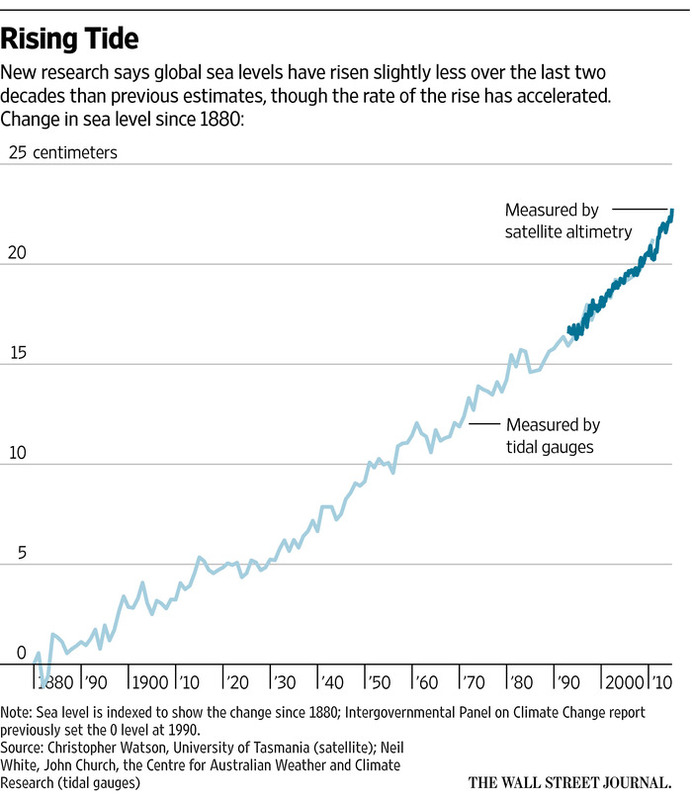 The results revise downwards the average rate of sea level rise since the 1990s. The IPCC’s landmark report in 2013 found the sea had risen on average by 3.2 mm per year since 1993. Waston’s study found the rate was slightly slower, between 2.6 and 2.9 mm per year. “I have no doubt there are members of the community who may wish to reevaluate [the predictions for sea level rise]. But as a scientist I come back to the data,” said Watson, preempting claims that the study was a scaling down of the threat of climate change to coastal communities. In 2013, Gregory’s report to the IPCC predicted that sea level could rise between 28cm and 98cm by 2100 depending on how much carbon human industry emits this century. “There is no reason to change the projections,” said Gregory. Bolivia’s access to the sea : beaches of the future ? 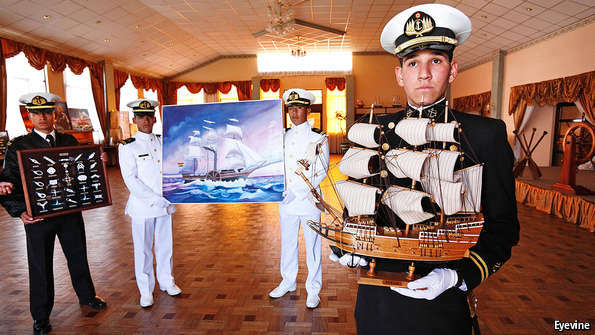 BOLIVIA has a navy. Merchant vessels sail the high seas under the Bolivian flag. The country celebrates March 23rd as the “Day of the Sea”. In fact, Bolivia has all the trappings of a maritime power except an actual coastline (confining its navy to lakes and rivers). It lost its littoral to Chile in a 19th-century war and has been trying to recover a piece of it almost ever since. Borders between Peru, Bolivia and Chile after and before the 1879 War of the Pacific. On May 4th Bolivia’s quest entered a new phase when the International Court of Justice (ICJ) in The Hague began hearings on its demand for Chile to grant it “sovereign access to the sea”, ie, territory that would reconnect it to the Pacific Ocean. The government commissioned 35 musicians to record a song, “Beaches of the Future”, to drum up international support. The first hearings address Chile’s objection to the whole procedure on the grounds that the court has no jurisdiction in the matter. 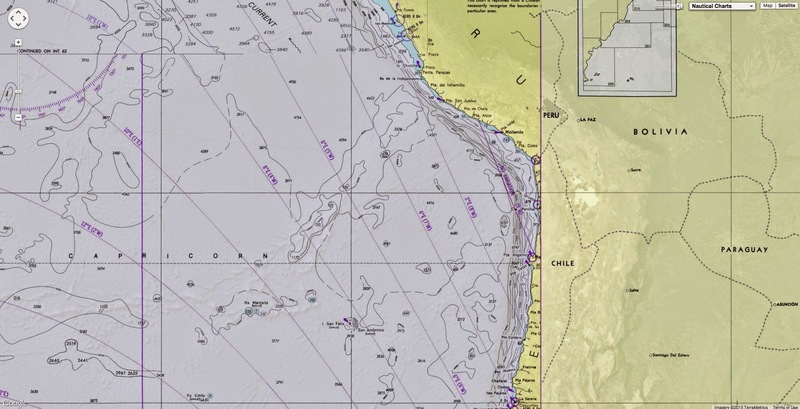 Only if the ICJ rejects Chile’s position, or defers a decision, will it consider Bolivia’s claim that Chile has an “obligation to negotiate” access to the sea. That, Chile will argue, is a dangerous notion. It would overturn the treaty that ended hostilities between the two countries, and thus pose a threat to the system of treaties that undergirds much international law. If that is right, more is at stake in the Dutch courtroom than Bolivia’s hankering for beachfront property. The struggle has its origin in the exploitation of nitrates, used for fertiliser and to make saltpetre for the manufacture of gunpowder, in the Bolivian littoral, whose sparse population was mainly Chilean. Angered by an increase in Bolivian tax on nitrate miners, Chile invaded the port of Antofagasta in 1879. By the end of the four-year war it had also defeated Peru, which had allied with Bolivia, annexing its departments of Arica and Tacna (see map). In all, Bolivia lost 400km (250 miles) of coastline and 120,000 square km of territory. Peace was concluded only with a “treaty of peace and friendship” in 1904, under which Bolivia accepted the loss of its Pacific coast. In return Chile promised Bolivia “the fullest and freest” commercial transit. Bolivia is not reconciled to the loss. The poorest country in South America, it blames its plight largely on its landlocked condition (see article). 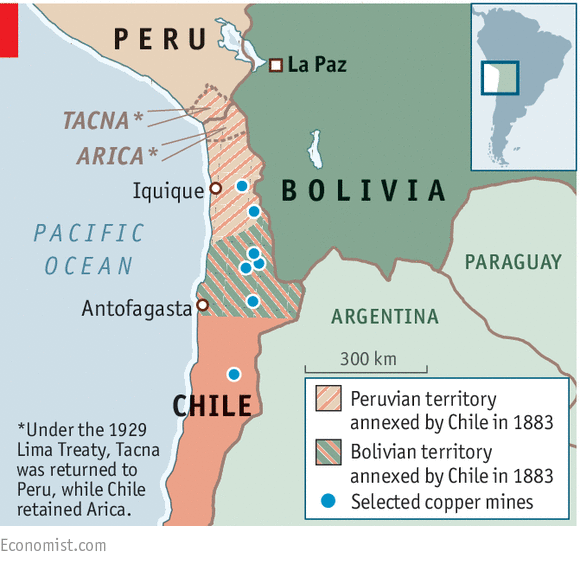 Much of Chile’s hoard of copper, its main export, lies underneath what was Bolivian soil. The commitment to free transit “is not as wonderful as Chile likes to portray,” says Eduardo Rodríguez Veltzé, a former Bolivian president who is now ambassador to the Netherlands. Although Bolivia has its own customs officials and storage in Arica and Antofagasta, it complains that Chile has created an obstacle course for exporters. It subjects Bolivian cargo to unwarranted inspections, for example. Bolivia’s constitution, enacted in 2009 under the current president, Evo Morales, calls access to the Pacific an “irrevocable right”. That frustrated ambition has made for a relationship with Chile that is at once prickly and intimate. The two countries’ citizens can cross the border without passports, and most Bolivian goods have duty-free access to Chile’s market. Despite the obstacles, two-thirds of Bolivia’s long-distance trade passes through Chilean ports. Yet liberal, outward-looking Chile has little rapport with the left-wing nationalists who currently govern Bolivia. Commerce lags behind its potential. Chilean companies, avid investors in neighbouring countries, have risked hardly any money in Bolivia. In turn, Bolivia has spurned big opportunities merely to spite Chile. A president who wanted to export gas through Chilean ports was forced out of office in 2003. In a referendum the following year, voters said Bolivia should use gas as a negotiating tool to gain access to the Pacific. With the suit at the ICJ, Bolivia is trying a new tack. It insists that this is not an attempt to reopen the 1904 treaty, as Chile alleges. Instead, Chile “brought itself into a new kind of international obligation” by repeatedly offering Bolivia some sort of access to the sea after the treaty came into force, argues Mr Rodríguez. In 1975, for example, Chile’s dictator Augusto Pinochet, fearing war with Argentina and Peru, offered Bolivia a corridor in territory that had belonged to Peru. It has that right under the treaty that restored Tacna to its control in 1929. No matter, says Bolivia. Chile is still bound by the obligation to negotiate that its offers gave rise to. This line of argument leaves Chilean officials aghast. It is “unheard of”, says Heraldo Muñoz, who was Chile’s foreign minister until the president asked her cabinet to resign on May 6th (see Bello). Bolivia is not merely asking for dialogue, which Chile would enter into, but negotiations under court order “with only one outcome”. The ICJ has no business judging the matter. Both countries are parties to the Pact of Bogotá, which obliges signatories to submit disputes to international tribunals. But the pact excludes conflicts that were settled before 1948. Even if the court claims competence, Chile is confident it will not issue a judgment that would call into question borders long settled by treaty. The ICJ is likely to rule this year on Chile’s motion to dismiss the case, or to defer a decision until it considers Bolivia’s claim. A finding for Bolivia would not end the saga. Negotiations would drag on, and could wind up back in court. No Chilean government would dare to surrender territory to Bolivia, at least not without compensation, perhaps in the form of a land swap. Even if Chile were willing, Peru could exercise its veto again. If Bolivia and Chile cannot resolve the dispute, they could try to work around it. Chile admits that there is room for improvement in the free-transit regime. Some suggest it could offer Bolivia a lease on an enclave over which it would retain sovereignty, similar to China’s former arrangement with Britain over part of Hong Kong. But no solution short of sovereignty will satisfy Bolivia. It “will never stop claiming”, says Bolivia’s man in The Hague. In this video, the Skoll Foundation visits Alasdair Harris of Blue Ventures in Madagascar, where he is building sustainable coastal communities. The Vezo people of south-west Madagascar have been living off the Mozambique channel for more than 1,000 years; their population is both defined and sustained entirely by fishing. But when biologist Alasdair Harris visited the region more than 10 years ago with his fledgling organisation, Blue Ventures, he found the vulnerable coastal villages were struggling to sustain themselves. The Vezo’s booming population had diminished local fish stocks. Unsurprisingly, the villagers of Andavadoaka had mixed feelings when Blue Ventures suggested closing one of their fishing grounds. Nevertheless, they agreed to a trial closure for a few months in 2004. “When we opened it they caught 1,200kg of octopus in one day,” recalls Gildas Andriamalala, who joined the project as a student researcher. Having won a Seed award in 2005, Blue Ventures has gone on to become a globally influential community conservation programme. Coastal communities in Madagascar quickly took up the model and the country now boasts hundreds of these marine areas that are monitored and protected by local people. Organisations in neighbouring countries have begun to replicate the model, as recognition grows for the importance of locally initiated conservation. the Vezo people caught 1,200kg of octopus in a single day. The need for such protection is increasingly acute. 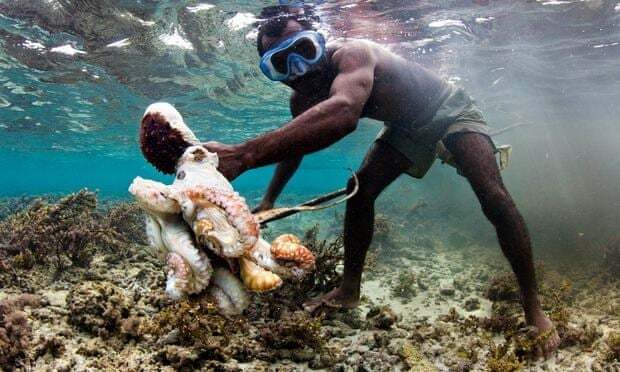 The Vezo represent a fraction of the millions struggling to survive in coastal regions that are further threatened by the burgeoning effects of climate change. Harris believes that marine conservation can only be sustainably enacted by working closely with those who depend on the sea, helping them to recognise the importance of conservation at a human level. “Our sector really does not get it right,” he says. Ecologists have called for 30% of the Earth’s oceans to be fully protected, but according to Harris that figure currently stands at less than 1%. To illustrate the magnitude of the progress in Madagascar, he contrasts its dozens of marine protected areas with the UK’s poorly regulated “two or three”. “We couldn’t have done more to destroy our marine ecosystems [in the UK],” he says. Meanwhile, in impoverished and politically unstable Madagascar, where catching fish is a matter of life and death, local people have set a humbling global example.